When the initial FAA report about Kevin Eldredge's came in, the key words in the report were: Fingers were crossed and breathing restricted! Yesterday, astute readers of the AAFO Hangar Talk Message Board reported the contents of the preliminary NTSB report on Kevin's landing with the key element.. "Examination of the airplane by the pilot and a local mechanic revealed the left main landing gear was collapsed, and the right main landing gear was separated. The left This brought about the following question "can it be fixed?". We're very lucky here at AAFO in that some of the finest racers and teams are visitors and contributors to Hangar Talk! Earlier today, Kevin Eldredge himself checked in to let us know he's OK, taking stock of his status as a racer and perhaps more importantly... savoring just how precious life and all that it brings with it can be! Special thanks to Kevin Eldredge for the following report! Thank you all for the kind words about my team, my plane, and me. You can never have to many friends, especially when youre around to enjoy them! I was returning from a tiring but exceptional week at Sun N Fun in Lakeland Florida. I departed Tuesday morning April 11th from a wonderful night of rest at my friend Mark Fredericks cool F1 Rocket Shop in Taylor, Texas. I flew 2.5 hours to Las Cruses, New Mexico, and stopped for fuel at about 930am. B lasting off from Las Cruses and climbing into the cool beautiful skies at 12,500, it was hard to keep the smile from my face thinking about how satisfying the past week was showing Relentless and enjoying such an amazing aircraft. I was cruising at over 300 knots, 12,500 feet in the clear smooth air for about 20 minutes when it felt like I ran over an elk! I hit a pocket of wind sheer hard enough to knock my Bose headsets into my lap. Not cool, but nothing more than I experience continually while chasing Darryl Greenamyer around the pylons at Reno. Almost immediately I noticed entering the cabin. I looked out the window and realized immediately that my direct route to Barstow had taken me right over the Mogolon Mountains and zero options to set down. I slowly pulled the power back once I noticed that the usual 190 degree oil temperature was now climbing through 235 degrees quickly. I turned south seeing that it was the shortest route to an open valley and possible option for landing. The plane, however, had a different idea. The was turning noxious and the windscreen was now a rippling medium brown color. At that point I knew the engine was losing oil fast and the two turbos being red hot must be the source of the . If I was not on I was going to be soon. I declared an emergency with Albuquerque Center [telling them] that I had a possible and was expecting a forced landing. 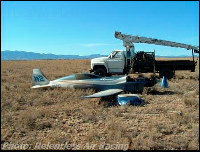 Once Center confirmed they had me on radar, I had the toughest decision I have ever had to make in my life; keep the engine running until I found somewhere to land risking being overcome by that was now very thick, or shut it down and hope that the source of the would stop while making my race plane a glider over a national wilderness area. After a few very long seconds I made the decision to shut down the engine and feather the prop. The oil temp was now 250 degrees, and the was unbearable. I later realized the aircraft had not started on but at that moment I really thought it was. I pulled the mixture, feathered the prop, and shut the emergency fuel shut off. To my amazement Relentless kept flying! The prop almost immediately stopped and the silence was deafening. At that point everything seemed to improve. The started to dissipate and I could see a small mesa of open golden grass appearing over the last ridge of the wilderness area. I started feeling much better about my situation and all I kept telling myself was to fly the plane! I remembered the best glide for the NXT was 140 knots and lowered the flaps to about 20 degrees. After a few moments I realized that the glide would take me across the last ridge and the open mesa would give me a shot at surviving. I arrived over the mesa center at about 2000 feet above the ground and noticed that there were a few roads and even a dirt landing strip at one edge of the mesa. Glenwood Catron E94 was the strip I saw and man was that lookin good. Now, not only could I survive but if I didnt do something stupid I might even save Relentless. I entered a high left downwind mainly because that was the only space on the canopy that I could see out of, the rest was rippling with oil. I remembered some great advice CJ Stephens drilled into me while training in my Glassair, it was much better to slide these planes in on the belly than to put the gear down and flip it over on rough ground. As I started to turn a high base leg I realized that I was too high and that the wind was coming from the south, meaning I would be landing down wind. I rolled right and then made a pretty aggressive S turn to lose altitude and position the plane better for a left hand short approach to the end of the runway. Wow, everything was looking great! I checked my speed and it was still right on 140 knots and made my decision that I would make the runway perfectly. The landing gear on the NXT comes out fast, but I knew the drag would be huge without power so did not put it down until I knew I was over the beginning of the runway. I dropped the gear and in a second the indicator showed down and locked. At this point I took one last look at the runway from my slight left slip attitude and then lined up the nose on what I thought was the runway. The oil made it impossible to see anything forward so all I could do was keep the speed up until I thought I was about to touch. Amazingly I actually touched down nicely at about 130 kts with about a 20 kts tail wind. I started out straight down the left half of the runway for about 500 feet; I kept the tail up and tried the best I could to keep the airplane rolling straight by watching the horizon out the left side. The quartering tail wind from the right and the fact I could not see, slowly caused the aircraft to drift to the left until the left tire hit a football size rock and it took the left tire off. I then slide along for another 1000 feet or so on the left tailing leg that remained and the right tire before the aircraft turned to the right and then ripped off the right gear leg. Once on the belly of Relentless I slid another 1500-2000 feet across the field and came to rest without a scratch. All I know now is the started right after I experienced the thud from the single air turbulence jolt. Upon investigation the FAA inspector found the crank seal on the front of the engine partially pushed out. Obviously the source of oil but at this point we still dont know why it blew? The engine only had about 20 hours since it was run in and tested at Lycoming and had run perfectly up until then. Everyone is eager to get to the bottom of this and I am sure in time we will find out what caused the seal to come out. I have taken stock and realized that I really loved that plane. I have placed it in front of everything in my incredibly blessed life and having a second chance to see my wife of twenty years, my two wonderful kids, and share laughs with my many friends has made me think that balance must become the priority in my life. Will I rebuild Relentless and keep my enthusiasm for racing and helping others build these kits? Yes. I have not flown a more amazing aircraft and flying is still my greatest joy. Will it be first in my life again? No. My God, my family, and my many friends must remain first and all I can say is how grateful I am that all three place me so high in theirs. So many of you have offered to do anything to help me and I ask only this, close your eyes for 1 minute and visualize the top 3 or 4 things that occupy the bulk of your time. I found in those six minutes gliding over the mountains very unsure if I would make it that those few things that took most of my time were no where in my mind. See you all soon, I hope! We asked Kevin just how bad the damage was? "It is really not that bad. We are trying to figure out how to get it home now. Jon and I have discussed how to repair but until we totally examine are unsure." We also asked the obvious question: Will you make Reno? Kevin's answer: "Not sure" will leave us all with fingers crossed tightly! We wish you well Kevin!